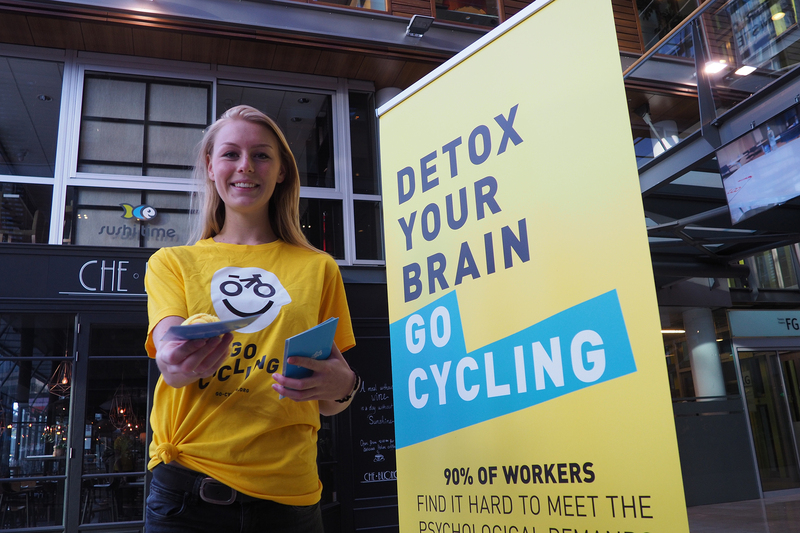 A new campaign called Go Cycling, connecting cycling with good mental health and business success, is launching today in Amsterdam’s international business district, Zuidas. The campaign will run initially from 8 – 12 October to coincide with World Mental Health Day taking place on Wednesday 10 October. The campaign builds on the fact that 1 in 4 people suffer from mental health problems each year, with many more of us suffering from stress and anxiety on a daily basis. Go Cycling aims to educate people to the wide-ranging mental health benefits of cycling and make it easier for more people to get on their bike. Nine in ten people working in the Netherlands report that they struggle to cope with the psychological demands of work. A number of leading studies have proven that cycling can reduce stress and anxiety, prevent burnout and help fight depression. In addition, four in five workers take sick days, higher than the European average. Cycling to work is proven to reduce sickness absence and prevent long term leave from mental ill health. Employees who cycle are found to be more engaged, effective and energised. Go Cycling launches with a website – www.go-cycling.org – (in Dutch and English) that provides employees with simple tips for how to start cycling. This includes information on incentives for cyclists, local routes, and options for buying, leasing or sharing bicycles and e-bikes. The site also provides advice for employers on how to make it easier to foster a cycling culture in their workplace. Businesses can share costs for a number of operations that facilitate cycling, such as installing parking and shower facilities, from Hello Zuidas. The campaign is a collaboration between Hello Zuidas, Zuidasdok and BYCS. On World Mental Health Day (10th October), BYCS will be hosting a free public breakfast event from its cultural events series ‘SHIFT’ at Circl, the ABN AMRO pavilion. The event will explore the topics raised by the Go Cycling campaign with international experts and speakers on mental health, urban planning and business. For more information and registration, head to here. One of the speakers at the SHIFT event is Ione Avila-Palencia of the Institute for Global Health. The Institute’s recent report concluded that people who cycled in cities were found to have better self-perceived general health, better mental health, greater vitality, lower self-perceived stress and fewer feelings of loneliness. Throughout the week, a large ‘pledge wall’ will be touring Zuidas. Everyone is encouraged to sign the wall and make a pledge to take steps to improving their own mental health.